Eric has sent his Tarmac with the request of standart BSA BB shell to be replaced with full carbon, produced in-house BB shell PF30. Jacob arrived to our workshop before he was heading down to the cycling trip in Middle East, but before that, he wanted to try out Alps with his newly purchased Daccordi. 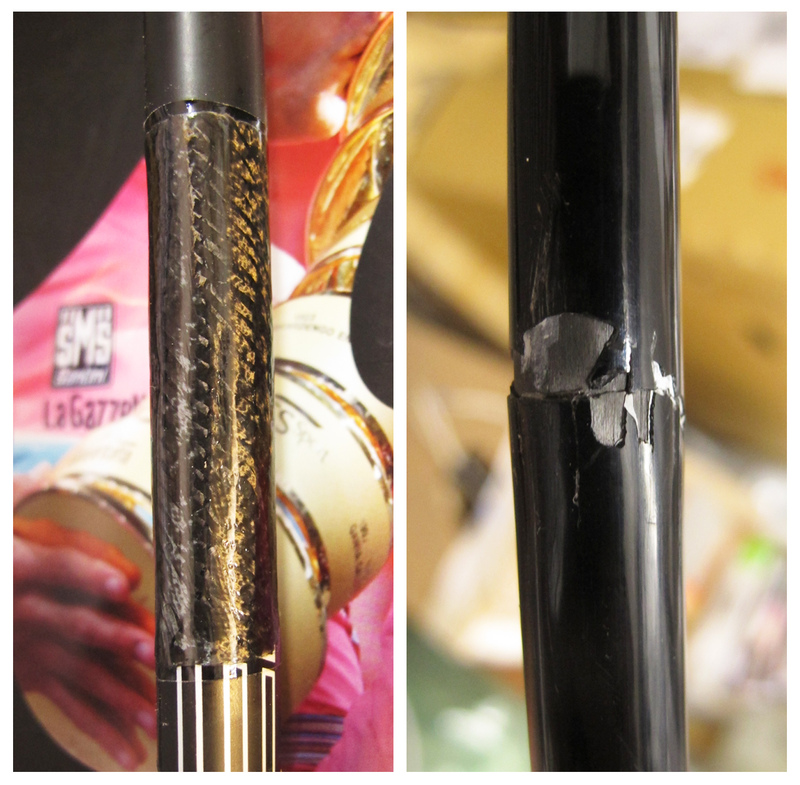 The moment he sat on his bike, something snapped – BB shell completely disconected from a down tube. We’ve found out that the frame has been repaired in multiple areas, which started to fail. 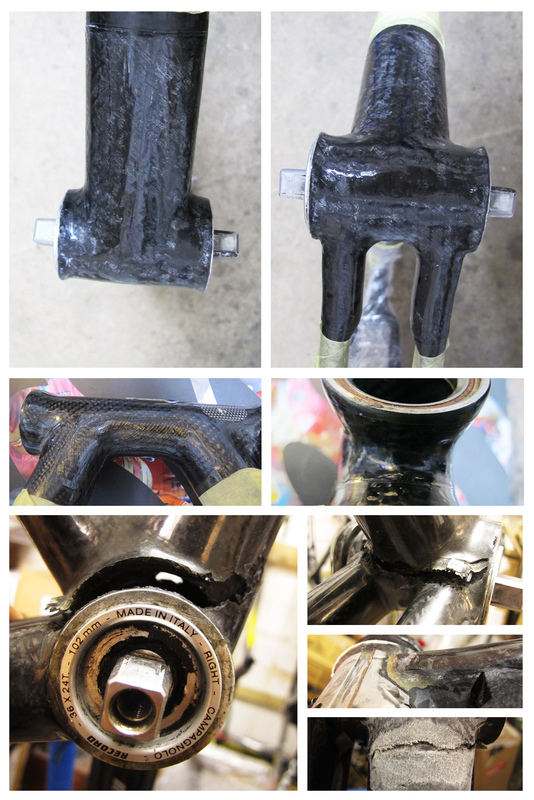 As you can see in the images, quality of the repair has been compromised by replacing carbon fiber with glass fabric in the base layers and polyurethane resin been used instead of epoxy resin. Today, Jacob is in the Alps and we are waiting for an image of Jacob and his Daccordi. P.S. Make sure that your repaires has been done by qualified people. 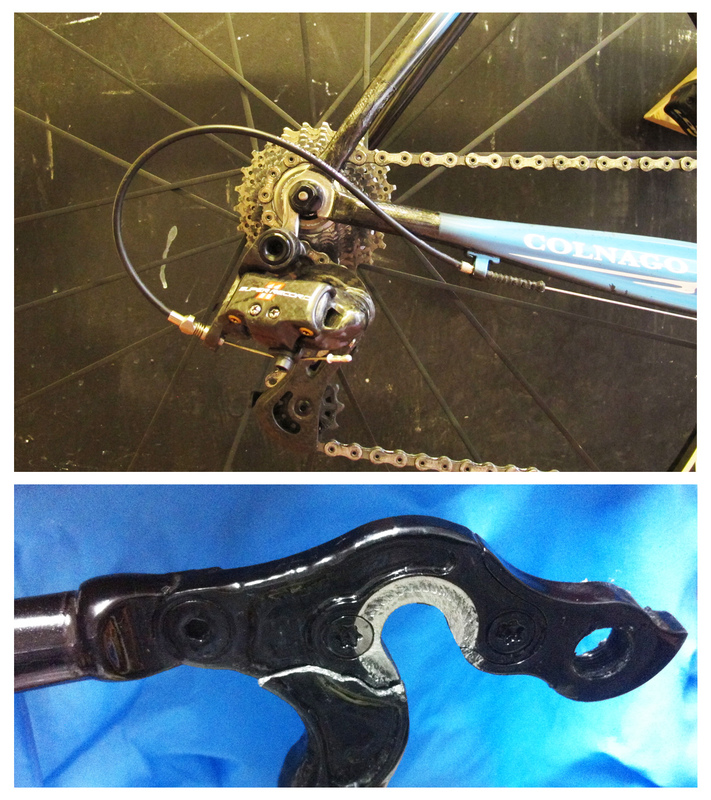 Mark’s Colnago original drop out failed. 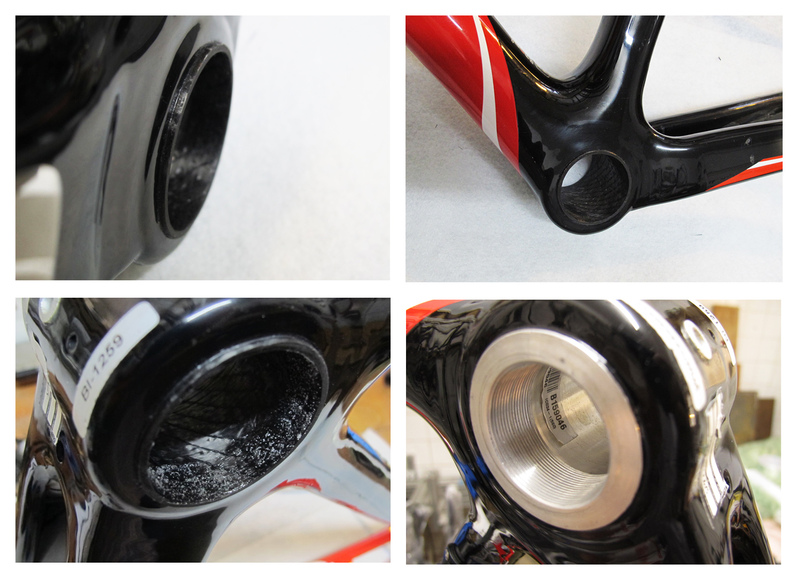 It seems to be a design fault as we have received a few Colnagos with drop outs cracked in the same place, the same way. Drop out has been replaced, Mark is back on the road. John came to us after we’ve been recommended by Look Mum No Hands. Aparently, in the past, bottle cage bosses came loose and bike has been repaired at Merkx factory in Belgium. 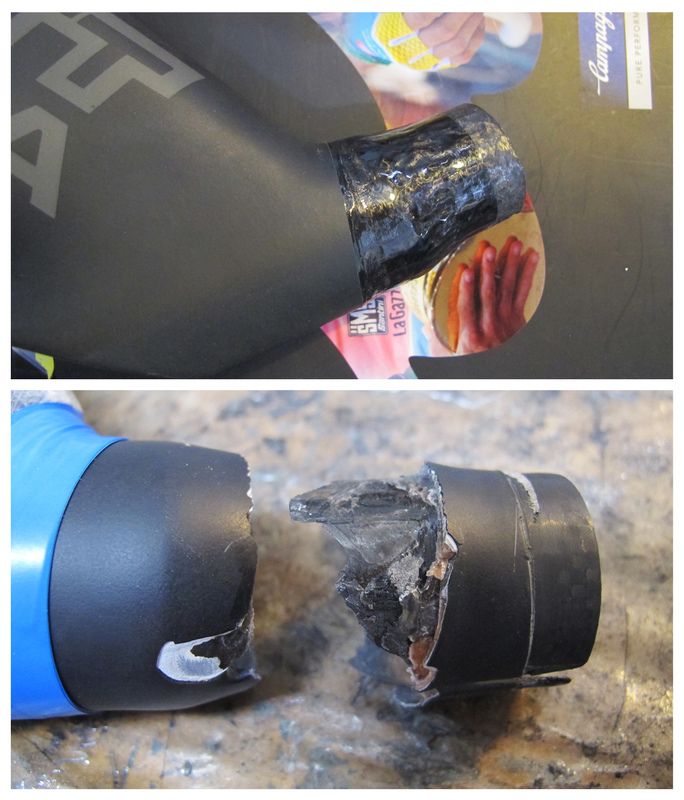 After some time bottle cage bosses became loose again and bicycle frame ended up at our workshop. Here it is now. We hope that John will carry on enjoying this nice frame for a long time. Zoran arrived to our workshop after somebody else has repaired his frame. Zoran: “It brake during the first ride”. 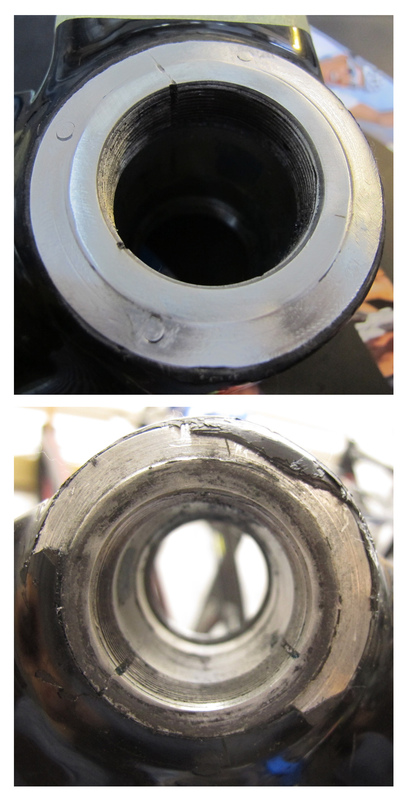 More then a couple of months has passed after repair has been done at our workshop and still no call from Zoran. We guess that no news is a good news. Richard was racing in Wales. He came off the bike when descending at +-35 miles/h. 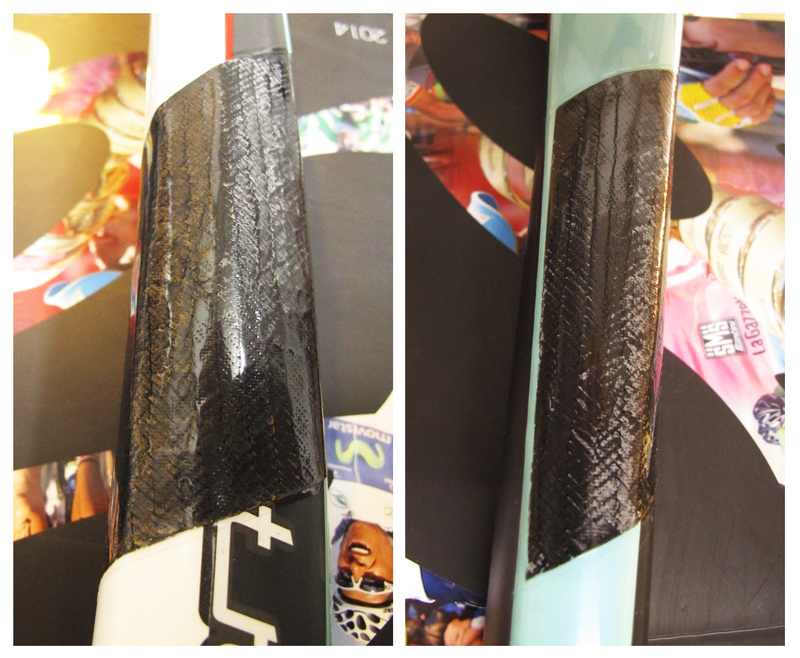 Seat stay snapped, but it didn’t stop Richard to complete the race – DETERMINATION! Richard is still racing and commuting regularly Brighton – London – Brighton. This beauty has arrived at our workshop by post. We haven’t had a chance to have a chat with the owner, therefore reason of damage isn’t known. 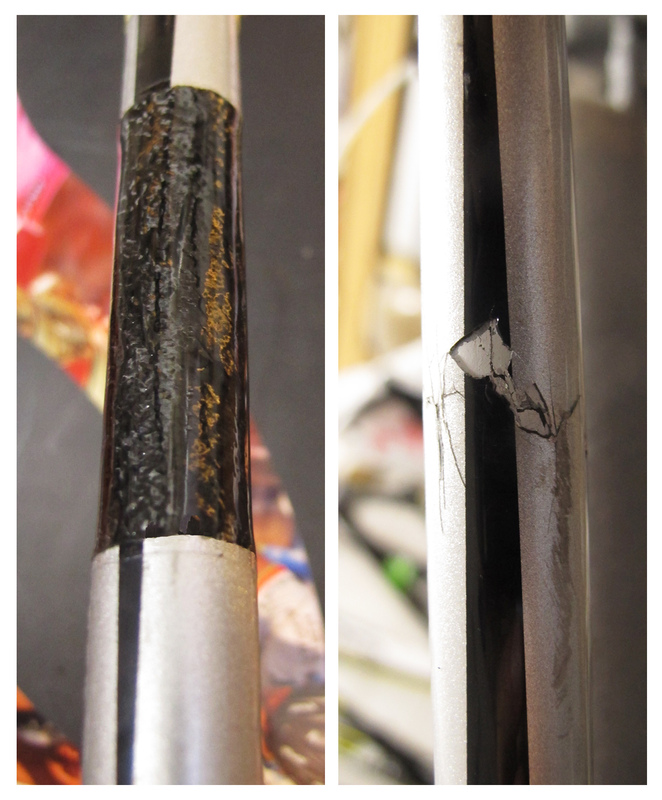 Top tube has been repaired using biaxial pre-preg and “baked” with our custom made “oven”.